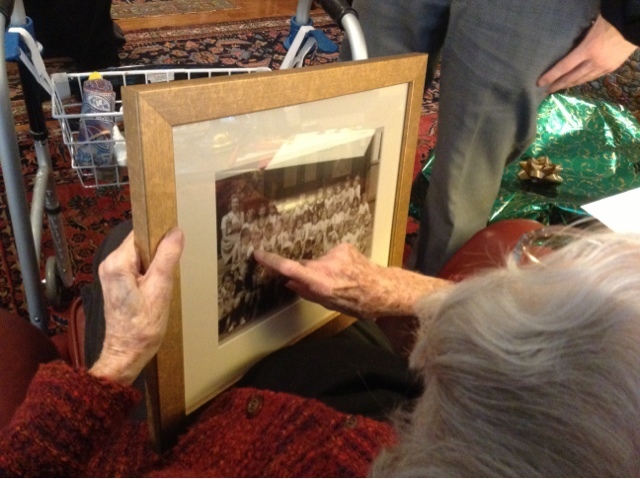 On Christmas Eve my 98 year old grandmother unwrapped her gift from my parents, a framed picture of one of the kindergarten classes she taught many, many years ago. At some point recently she'd shown my mother a small snapshot of her and the many, many students in her morning and afternoon kindergarten classes and told my mother that she wanted it blown up and put in a place where she can see it everyday because it makes her happy. She didn't ask for a picture of her great granddaughter, who happens to be named after her. She didn't ask for a picture of our family all together, pictures of her own children, or even of her dogs (they had a lot of dogs over the years). She wanted a picture of her class. I leaned over her shoulder and listened as she pointed to each child, telling stories about the kids who were naughty, the ones who were silly, the sweet ones, the smart ones. Although she couldn't remember all of their names she certainly remembered their personalities. This is what it means to be a teacher. For 10 months out of a year we become fully committed to a small group of little people. We think about these people day and night. How will we get them to read? 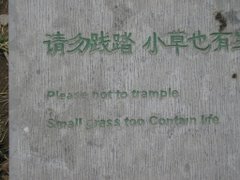 To sit quietly? To understand fractions? To be good friends? Lately we even lie awake at night wondering how we will protect our students from terror. Our classes stay with us forever, becoming as much a part of the story of our lives as our own family. So much so that 70 years after they've come and gone we will still remember them. My own fridge is just starting to have more pictures of my own daughter than my former students. Every morning as I get my coffee I still smile at students I taught 7 years ago. At this point they may have forgotten about me, but I can't forget about them. I often forget I come from a long line of teachers. My grandmothers have always been my grandmothers- growing up their stories were about my parents and their siblings. I thought of them as good cooks, great book-readers, and fun play partners. I forget that they too dedicated a part of their lives to the classroom. I'm looking forward to going back to my grandmother's to hear mor stories about her kindergarten classes. For the first time in ten years all of the students in my class are from homes that celebrate Christmas. It was odd, really, being able to openly discuss the holiday as a class. I'm use to being much more cautious and quiet about it. We didn't do anything overtly Christmas themed, but we just all seemed more relaxed about the holiday. Today was absolutely one of those days that makes me love my job. We walked like reindeer in the hallway (reindeer are silent because they can't wake up the kids sleeping). We had a dance party at the end if the day and danced to all of our favorite songs. We made snow flakes by sticking pretzels into marshmallows. We laughed and played. The kids hugged each other all day. In a Christmas miracle turn of events our order from donors choose came today. Much like Santa delivering a sack of toys, our secretary came down to us with a huge box. Opening the presents to the classroom and finding a toy barn, a doll house, dolls, and art supplies my class just gasped in excitement. As we unpacked the barn a few exclaimed, "Where's Mrs. Wishy Washy?" They know me so well. The absolute best part of the day, however, was when we played Santa and gave out small boxes of chocolates to people around the school. We wrote them cards and then filled the boxes with chocolate- not eating any for ourselves. We talked a lot about gift giving and doing things for other people. As we handed out our gifts they all exclaimed, "She's happy!" "Look, we made her happy!" Each and every time they squealed with joy at the happiness they were giving to others. It was one of the sweetest, most heart warming experiences I've had as a teacher. At recess the other day I looked out and for a moment assumed that a soccer ball had gotten stuck in my friend's wheelchair. I started to say something to him, but as I watched I realized that he put it there on purpose. He was using his chair to move the soccer ball across the black top. He would get the soccer ball to roll away from him, would chase it down, trap it, and then would drive it around the blacktop. Rock Star, being the rock star she is, was running along beside him, keeping other kids from stealing it, and just generally encouraging him. The smile on his face was just about equivalent to a major league soccer player running across the field after scoring a winning goal. My morning started with the deep sense of dread- a quick check of my email let me know that BOTH of my aides would be out. The mere thought gave me such an intense headache that I considered staying home myself. Maybe the school would call my families and tell them to just stay home. Prepared for the worst I sulked into school, wondering how on earth I was going to make it with two subs in the room. My kids don't do well with changes in our routine- what would this do to us? My only solution- the solution I come up with whenever I'm at a loss of what to do in the classroom- is MORE SINGING. So, it's all we did. All day. Sing. And dance. And sing some more. We sang rock ABC songs. We sang calming ABC songs. We sang about the days of the week- maybe three or four times. We sang about money. We sang to count by tens. We even sang about the gingerbread man. It turned out to be my favorite day all year. My kids ROCK. VED my house keeping center. I found it to be such a great teaching tool- we had so many opportunities to practice spontaneous language over there, as well as chances to teach children how to play appropriately and interact with one another. I had a stack of envelopes and cards there as well so that the students could write notes and letters to one another, or take orders if they were playing restaurant. I had a cash register so we could practice counting money while we were playing. Lots of opportunities for language. Every kindergarten class at my old school had a kitchen center, so I didn't think anything of it. 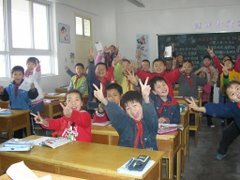 Last year I mainly had kindergarten students, along with two first graders. I'd frequently thought about all the great things we could do this year if we had a toy kitchen, but hadn't done anything to actively get one. I was surprised to walk into the kindergarten classrooms at my new school and not see toy kitchen centers. It seemed like such an integral part of our kindergarten rooms at the think tank. Last week an instructional aide for another classroom popped into my room to ask me if I wanted a toy kitchen. The after school care had found an old one they didn't want and immediately thought of me. "YES!" I exclaimed, without thinking. I was ridiculously excited by this development. Finally, we'd get down to our important play-business in our room. One of my colleagues, who has been teaching students with intellectual disabilities for years, happened by my room later that day. I have the utmost respect for this teacher, and truly listen to everything she says. She expressed great concern for me taking the play kitchen. "This isn't preschool, this is kindergarten. Our kids need to be exposed to age appropriate toys and games. If the general education kids aren't playing with it in school then our kids shouldn't be playing with it in school." I was stunned, but I could understand what she was saying. 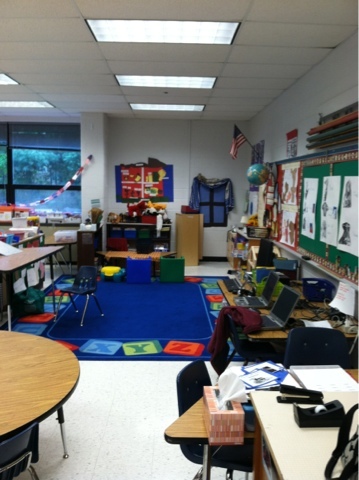 What does it look like to have my second grade students walk into a classroom where there is a toy kitchen? What message does that send to the rest of the school? The thing is, I firmly believe that general education classes should have more time for creative play. I would have LOVED to have a toy kitchen in my gen ed first grade classroom. There are so many ways to use it for academics. Just because it's play doesn't mean we can't use it for learning. I thought long and hard about whether I was going to keep the kitchen. I don't want to make my children any more different than they already are, but I also want to give them opportunities for growth. 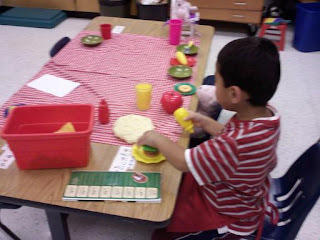 The kitchen allows for organic language opportunities. It teaches them to have interactive play, something they aren't going to learn without adult assistance. We can put math and literacy into the center. It will never just be "playing". If asked I can always explain what the kids are doing and how it supports their goals. The first day I let three of my students go to the kitchen center I sat back to take notes on the language they were using. Without an adult prompting them they were having back and forth conversations- they were playing- using the toy food and pretending to eat. These little things are HUGE for my kids. I honestly had never heard this group of children communicate with one another like that. I just can't put aside my beliefs on the importance of play. I'm sure there are higher-ups in the county who may come down on me when they realize what we're doing. But until then I'm going to keep using the kitchen center to enrich our free-choice time. We're going to keep using it to practice talking to one another, using appropriate social skills, stretching out the sounds in our words while we take one another's orders, counting food we're putting onto plates, and following photo recipes we've previously cooked. Labels: house keeping project, intellectual disabilities, play, whats really important? Every morning I meet two of my students at the bus and bring them back to my classroom. Waiting in the gym is too noisy and overwhelming for them, so we go straight to our room and get started on our day. As we walk down the hall (it's a long walk) I find myself chatting with them, although it tends to be a one-way conversation. "Good morning! I missed you this weekend! Did you have fun?" Pause for an answer. One of them may repeat the question, but both will keep walking. "Did you do anything exciting this weekend?" Again, one may repeat the question, but I don't really expect an answer. When we're in the classroom and I've got visuals and it's quiet I'll ask the same question in a more appropriate way for my kids to answer. This is just... chatter. Because that's what kids and teachers do- they talk to each other in the hallway. "I had a GREAT weekend! It was SO exciting!" he gives me a winning smile that seems to say, "It's OK teacher, I don't know who you are, but I'm listening to you even if your own students aren't." I can't help but feel that he was feeling sorry for me- surely wondering why my own students don't talk to me. I must admit, I appreciated the kindergarten sympathy, even if I didn't need it. It's nice to know someone is listening. When I stumbled upon the magnet sensory-center on Pinterest last week I thought it was brilliant! Put shredded paper in a box/sensory table, put paper clips inside the box as well. Give the student a magnet and let them use the magnet in the paper to find the paper clips. Do you have any idea how hard it is to clean up shredded paper from the classroom floor? Surprisingly harder to clean up than the tiny grains of rice that had previously been in the center and were driving me crazy because they seemed impossible for us to pick up with our pincher grasps. I was coming out of an IEP meeting at another school on Friday afternoon when I heard the news. Not quite processing what was happening, not quite understanding what was being said on the radio, I sat in my car instead of driving away. I knew all the words individually, but when they were put together I couldn't make sense of them. It couldn't be right. I was immediately hit with a need to drive back to my own class, who I knew was preparing for dismissal to hug them and reassure myself that they were safe, along with the same urgent need to drive to my daughter's daycare and hug her tightly. I still can't quite process the news. I don't think any of us can. We are all desperately grasping for something to hang on to- something to blame, something that explains what happens, something that will identify an easy fix. Gun control, school safety, an increase in mental health services, a desire to put God back into the schools- these are all things I've heard and read about in the past 48 hours. If only it was that simple. For us to be able to say, "All we need to do is fix x and y will never happen again." We need that. I need that. From my own perspective on the world I find myself blaming mental health services. If this boy had gotten more help, if we'd been better prepared as a society to help one another when someone doesn't fit into the box, if we'd offer more opportunities for counseling and therapy. But that's just what I find myself hanging on to for answers, something to comfort myself when I wonder how it even happened. I don't think we'll ever have answers we desperately want. Somehow, we- teachers across the country- have to enter their classrooms tomorrow and tell ourselves everything is OK. We will hug and smile and talk to our children. Sing our routine songs, laugh at jokes, and practice whatever drills the schools will ask us to practice. If the children bring it up we'll talk about it, we'll talk with counselors, we'll read books, we'll listen to our children's fears. Nothing tangible has changed within our own buildings, yet everything has changed. I think every teacher looks into the eyes of the photograph of the teachers who were killed and says a silent prayer, knowing that it could have been us. We are all praying for those beautiful teachers who spent their last moments protecting their students. I can only imagine what they went through- that last desperate desire to protect their students with everything they had. If you haven't taught, haven't had a classroom of students to yourself, haven't fallen in love with a bunch of little people who have truly no relationship to you outside of your professional life, it's a love that may be hard to understand. When you teach your students become your own children. Your classroom becomes your family, your daily reality, the little people you spend the majority of your waking hours with. To think of anyone wanting to harm those little people- those people we spend hours agonizing worrying over- is heartbreaking and terrifying. We have the power to do so much for our students- yet we don't have the power to prevent their exposure to such truly horrible events. Those little ones who can drive us crazy and consume all of our time- what we feel for them as teachers is a true love. In writing this I am simply trying to process it all myself. I have no message, no understanding, no clear form of how I am going to begin or end this blog post. They are just words, put together, whose meaning is still a bit unclear. Tomorrow I will go to school. We will sing our good morning song, work on making eye contact, using full sentences, and smiling when we see people. We will do our reading centers and sing our math songs. We'll have a dance party while we practice counting by tens. Because of the nature of my class I don't expect anyone to ask about Friday's events. On the outside it will look like everything is the same, but inside we will know that it will never be the same again. I've found that the most inspired teaching ideas come from those true moments of desperation. A few weeks ago we were in the middle of our map skills unit and we were working on building a map of our classroom. It was painful. My kids, with their difficulties in abstract thinking, were really struggling with the idea that the big piece of construction paper was equivelent to our classroom, and that the brown squares of paper we were taping onto the "classroom" were really the tables. I wrapped it up quickly, leaving off at least a fourth of the room where the teachers' desks are. We were done. With ten minutes until recess. Ten minutes isn't enough time to start a new activity, it's a bit too long for a random story book, and way too short to just recap the failed activity in some meaningful way. It is at moments like these that true teaching happens. For whatever reason- a visit from the teaching fairy- the Saint of Desperate Teachers- I grabbed a toy sheep in our classroom and a board maker icon of a sheep. It just so happens that I had the icon already made from a previous lesson, and it was sitting on my desk. The only reason the "sheep game" came about was because I hadn't bothered to clean up. I decided we'd play a "hide the sheep" game. Very similar to a game I'd played in my gen ed room where I'd hide an object and then the kids would have to silently look for it, following the directions "hot or cold". This time, however, I put the icon of the sheep onto the classroom map. The kids needed to first look at the map, determine where the sheep was, and then go find the sheep. It just so happens that using a map is one of our testing standards- and one that we absolutely were at a loss on how to teach. (The year before I taught this by giving them maps when we went to the zoo on a field trip, simple and easy, but not easily replicated). The first few times we played the game it was ridiculously painful. Because they hadn't gotten the concept that the map of our classroom WAS our classroom they could tell me where the sheep was on the map, but they'd still wander all over the classroom. They'd go to the last place I'd hidden the sheep, wondering why it wasn't there. But slowly, after playing it every day for awhile (turns out it is a great time filler) they can now use the map to find the sheep. They are actually starting to use map skills! And, it's a quick assessment of who understands maps- the kid who goes straight to the correct area of the classroom based on the map vs the kid who still looks around frantically- shows me who understands the concept. Most importantly, I'm really glad I didn't just give up when they couldn't play the game at first. It was ridiculously painful to watch them play, and it would have been easy to shake my head and say, "This is WAY too hard." Watching their map skills grow over the last few weeks because of this "way too hard" game has served as a great reminder of the importance of high expectations coupled with repetition,determination, repetition, and repetition. I've been asked to give a talk at my church about children with special needs. Since I compose my thoughts best through writing I thought I'd plan for it by writing here. This topic is incredibly broad. It's almost impossible to decide what to broach first. It's like asking, "talk about parenting" or "talk about all the different children and their parenting needs." The label "special needs" implies that some children are normal and some are not. There is a mental line we tend to draw between the two that easily sorts children for us. But let's be honest- no child is "normal". Every child has his or her own quirks, strengths, special skills, and areas of concern. My husband is constantly amazed/frustrated that child development isn't a clear science- how are children so different? How come ours didn't walk until 14 months and his niece walked at 12? And that kid we saw on the playground- he was walking at 11 months! What's important to keep in mind is that our children, the children in our schools, our communities, our children first. When you think of the characteristics of your child you think of what makes them laugh, their smile, what makes them cry, when they need a hug, what their favorite toys are, or what they need to fall asleep at night. Whether or not they are a child with a disability doesn't change those characteristics. Children are still children, with or without a label. Sometimes we make the mistake of seeing the disability and not the child. Whenever I read the Holland story I find myself tearing up because I've watched so many parents go through this journey. I can't begin to comprehend it myself, and I get the benefit of knowing the child first in the immediate moment. I get to know the amazing child where they are at this particular moment in time. Not being their parent I don't experience a loss of a dream, I just get to focus on the child's current strengths and needs. One of the aspects I think must be the most difficult in parenting a child with special needs is the outside world. Even with a typically developing child I experience the judgement of other parents. Why do we do that to each other? Little Lipstick melted down in the grocery store a few months ago and not one but two people, complete strangers, told me she was spoiled. They didn't know she'd skipped her afternoon nap, had been sick, and was at the end of a very long day. I felt awful. I never wanted to go into public again. I was torn between wanting to stick my daughter in a corner and let her cry to prove to strangers that she wasn't spoiled, or to cuddle her and tell the strangers to go stick it. That was once and it still bothers me. Children with disabilities have an even more difficult time in public. Grocery stores are overwhelming places. There is noise, signs designed to get your attention, strangers, people not observing personal space, food you aren't allowed to eat, and distracted parents. Even for children with learning disabilities grocery stores are demanding. Trying to navigate the strange place, read faces, compensate for difficulties in remembering what your mother just told you- it can be too much. Meltdowns too easily lead to judgement and I've worked with many parents who feel trapped in their own homes, scared to go out because of what others may say. The public is a harsh world. I've heard of people making business cards so that when people judge their child's tantrums they can hand them a card that says "This is Johnny. He has autism". We as people must be nicer to one another. Withhold our judgement of the parents in the grocery store- we never know the true story behind each parent's struggle. We also must be careful to never blame the parent for the disability. A child doesn't have an intellectual disability because the parents didn't teach her the letters. A child isn't autistic because the mother didn't provide the right structure and love in the house. When I worked in kindergarten special ed I was a part of a team who would tell parents for the first time that there were concerns about their child's development. It is awful to sit down and broach these concerns with a family, particularly when the family has no idea- it is the oldest child, they are not around other children very often, and they do not see their child's characteristics as different. Accepting the disability can be difficult. I've watched many parents struggle with it. They worry that the label will mean that the school will write off the child, that people will have low expectations, that giving the child the label will give them the disability. They worry that the school or doctors doesn't know the child like they do- that the school is seeing something that isn't really there. These are legitimate concerns. They can't be overlooked. I have seen children wrongly identified by a school who was too quick to push the paperwork through. But I've also seen children struggle without help because the parents were not ready to accept the label. It's always heart breaking to see a child who could be so much farther along than they are because they didn't get the help they needed early on. It's important to remember that the label doesn't change who the child is. The same child who goes to bed the night after you sign the paperwork is the same child who woke up that morning. The child himself doesn't change. The services that are offered to the child change, but nothing should change the relationship the parent has with the child, who the child is, and what the parent's goals are for that child. In many school systems the label can give your child what your child needs to be successful. It gives your child additional attention, additional resources, access to physical therapists, occupational therapists, additional technology, additional legal rights, additional data collection and monitoring than the typical child. These are not bad things. The important thing to remember with the school system is that you don't have to sign anything the day of the meeting. You can think about, take a copy of the paperwork home. You can bring your own support systems to the meeting so that it doesn't feel like you against the school. (And it shouldn't ever feel that way). You are a part of the IEP team, the most important part in many ways, and you have a voice at the table. There is a page on the IEP where your concerns can be voiced. Anything you want can be added there. It's a topic I could talk forever about, but the broadness of the topic almost has me at a loss for words- where to begin, and when to finish. There is so much to say. Yet the most important thing to remember is that children are children. The children in our community are our children. We must treat them like we do all children, including them as we would other children, considering their preferences and needs while still maintaining the expectation that they are a part of our community, and withholding judgement from parents. I'd heard it was being debated but they finally got it approved. On Saturday they officially dropped the term Asperger's syndrome from the new addition of the DSM that will be out in May. It will be interesting to see if or how this impacts students who are currently eligible for special services under this category and if there are any practical changes that we see in the schools. These children may still qualify under the category of Autism, or may not depending on the nature of their disability. Last year I started a teacher research project with my librarian and speech pathologist on using physical objects to teach children with disabilities how to retell stories. It was awesome and we were so excited by what we were seeing emerge from our students. Then I switched schools and ruined everything. I thought I'd be able to keep up the research part of it, but this year has proved to be a busy one and I haven't had a chance to document, write, research, and take data like I wanted to. I have managed to continue to use the theory behind the project and although I haven't been able to take data on it, I've been very pleased with how it's going. Because I also switched from teaching a non-categorical population to a specific classroom for children with intellectual disabilities I've also had to enhance the project even more, but it continues to work out. About every two weeks we start a new book. It's a book that I've adapted- cut up, laminated the pages, and glued things onto so it will be interactive. In Max Cleans Up I made parts of the book that were suppose to be sticky actually sticky using two-sided tape. When Max dumped sand all over the floor I used glitter glue so they could touch the rough sand. The Easter egg he was hiding in his underwear drawer was also touchable to draw their eyes, fingers, and therefore their attention to the important object on the page. It helped them attend to the important parts of the story and therefore follow the narrative of the story. It's part of teaching them how to listen to a story as a narrative and not just something passive that is in front of them. I've also added words using Board Maker software to each page. One phrase goes on each page in the book, "Clean up, Max!" , or, "Sneaky Gorilla!" for Goodnight, Gorilla. I'm also using Boardmaker to make icons that represent the beginning of the book, the end of the book, and 'next' so that I am drawing their attention to 'FIRST', 'NEXT', and 'The End' of the story- vocabulary they need to know to retell a story. After the first week the book goes into the retelling center along with objects that can be used to act out the story. For the Knight and the Dragon we had a castle, dragon, a knight and a princess. I bought Max and Ruby dolls so they could act out the narrative while putting all of Max's objects into a big pocket. On Thursday I could hear them "playing" from across the room "Clean up, Max!" Rock Star said in her bossiest voice as she bounced Ruby up and down on the floor. Through watching them play I can see that they do have an understanding of what's happening in the story. They can build the narrative themselves, from beginning to end, in the correct order, even if they couldn't use words to tell me about it. I'm loving teaching this way. I'm enjoying adapting the texts and finding ways to make the books meaningful to children who may have difficulty attending to a traditional story. I love bringing the books to them and making them come alive, and in turn handing the story over to them with characters from the story so that they can retell the story themselves. I really find the retelling center, or honestly, the play piece, to be one of the most powerful. The fact that they get to play with the objects- allows them to use their working memory in a preferred comfortable way that they may not use it when they were in class. They are using what they've just learned and freely applying it to a play situation, mentally massaging facts, remembering them in their head so that they can use them to say what happens next. It forces them to hold information in their working memory and use it, taking it in and out in the way most kids do easily. It also teaches symbolic representation- something that is essential to learn in order to read, write, or just navigate through the world following signs and maps. 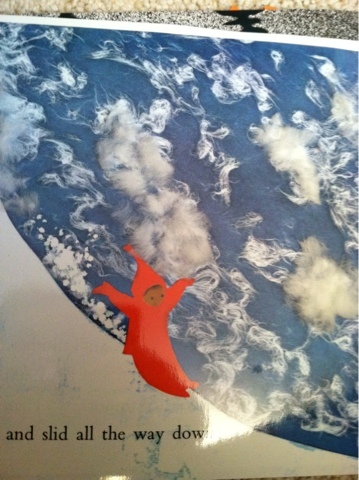 The day before Thanksgiving I dumped a series of little men, women, and animals onto the floor for the retelling center. It was actually a set of James Town settlers and Powhatan Indians but I figured they would also work as the pilgrims and Indians we'd been studying, especially since my main focus was for them to understand the difference between past and present. As I listened to them "play" I could hear them acting out the story- and interacting with it in a new way. They were embellishing details and adding different subplots, but none of those subplots involved going to the store, watching tv, or driving in a car- everything the characters did would have been something the pilgrims and Indians did- it was all in the past. As I'd dumped out the "toys" one of my friends asked, "Can we play?" It was the day before Thanksgiving. I was tired. "Yes" I said, not bothering to say something like, "Retell the pilgrim story". Right as she asked, "Can we play?" my principal walked in. He wandered over to them and bent down, "What are you playing?" he asked. I looked up from my reading group, cringing and expecting to hear "toys", or "house". Instead my friend looked up at him and said, "We are playing the pilgrim story when they came to America." Sigh of relief. It's working.